Is "multitasking" a nice way of saying "not getting anything finished?" Well, I don't have a completed quilt to show you just yet...but I swear I haven't been sitting around watching tv all day long. I have a lot of projects "in the works". The above photo is from a quilt top I just finished, using my Off-Centered Squares quilt pattern. The colored fabrics are Moda Cross Weaves, the tan is an Essex Linen and the white is Kona White. Let me just say, making a quilt out of mostly cross weaves is challenging. Lots of stretching and fraying. 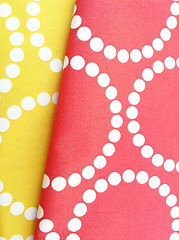 I've also finally cut into my Little Apples fabric by Moda designer Aneela Hoey. 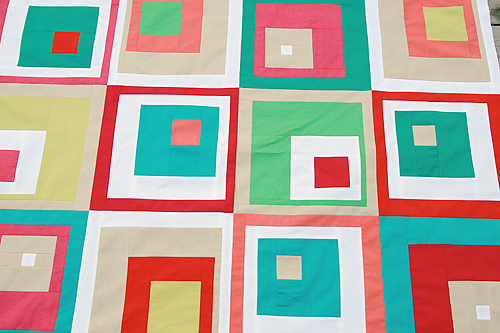 I fussy cut out her cute designs and have been making various size squares. 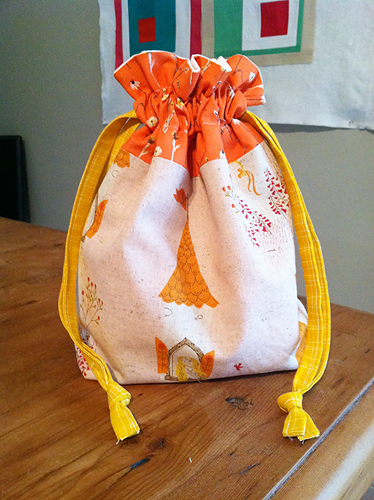 I made a little drawstring bag for my daughter to carry around her princesses. This uses Jeni's awesome tutorial. The bag fabric is from Heather Ross' Far, Far Away 2 and 3 lines. On the right is a bag I toooooootally copied after seeing this fabulous bag by Darci on Flickr. The pattern is by the talented Anna of Noodlehead, her Runaround bag. The fabric is from Moda's Hometown line. And...I have a bit of new incoming fabric, including these pearl bracelets from Lizzy House's Outfoxed line and these turquoise and red prints from Meet the Gang, by designer Marisa Haedike of Creative Thursday. So that's what's keeping me busy! What are you working on this week?